It’s really not difficult to establish traffic control for a construction site. Merely distribute some construction zone barriers, deploy a squad of flaggers, and the task is all sewn up. Well, this scenario might be true in Fantasyland. In the real world, however, the job actually begins with the development of an effective construction traffic control plan. For this reason, Roadway Construction Services (RCS) has concentrated much of its energies and ingenuity on effective planning strategies. Until all the pieces are in place and all details covered, we don’t place a single A-frame barrier or K-rail on the ground. Solid construction traffic control planning is the difference between safe, orderly traffic flow and potential chaos. As can be imagined, those who do the planning are master strategists. Yet despite the importance these highly-trained experts, the process really doesn’t begin with them. It begins with local officials. It is they who say ‘yes’ or ‘no’ to all ideas, proposals, and recommendations. Therefore, we dig in early to get a sense of their thinking; gauge their expectations. Driven by a need to know, our investigative team plugs into a network of key municipal decision makers, such as government officials and business leaders. What are their needs and objectives? Where are the right of way areas? Answers to crucial questions such as these become the building blocks of a sound construction traffic control plan. You might be asking, why go through such an intensive investigation every time? Aren’t municipal requirements pretty much the same everywhere? Not at all. Every construction project and city is unique. The needs of a moderately-traveled road in Irvine likely will be light years away from those in Century City. There is, however, one common ground on which all decision makers stand – a strong desire for minimal impact on the community. This means, traffic flow and public safety are not to be compromised. RCS builds minimal impact into every construction traffic control plan. To achieve this goal, our team coordinates its strategies with a variety of organizations and institutions. 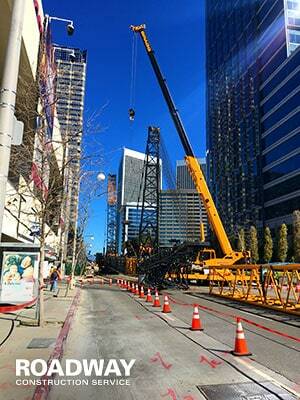 In the process, we address issues ranging from excavation to crane setup to material delivery. We also may need to coordinate our planning with utility companies on issues related to gas and electrical connections. Clearly, construction zone traffic planning places a lot on our shoulders. But it’s a challenge we willingly meet with unmatched expertise. To learn how our traffic control planning services can help maximize the efficiency and safety of your construction project, reach out to RCS for more information and answers to all your questions.